Warrior's Club (Warrior's Reward) wins the Commonwealth (G3) at Keeneland on 4.7.2018. Luis Contreras up, D. Wayne Lukas trainer, Churchill downs Racing Club owners. The Kelly's Landing, which attracted a field of 10 sprinters, is one of three stakes races on Churchill Downs' 12-race closing day card. The seven-furlong Kelly's Landing will go as Race 10 at 5:26 p.m. (all times Eastern). Trained by D. Wayne Lukas, Warrior's Club (24-5-5-4—$614,504) has taken his 200-member club on a memorable journey with 24 starts spanning racetracks in Kentucky, Arkansas and New York. 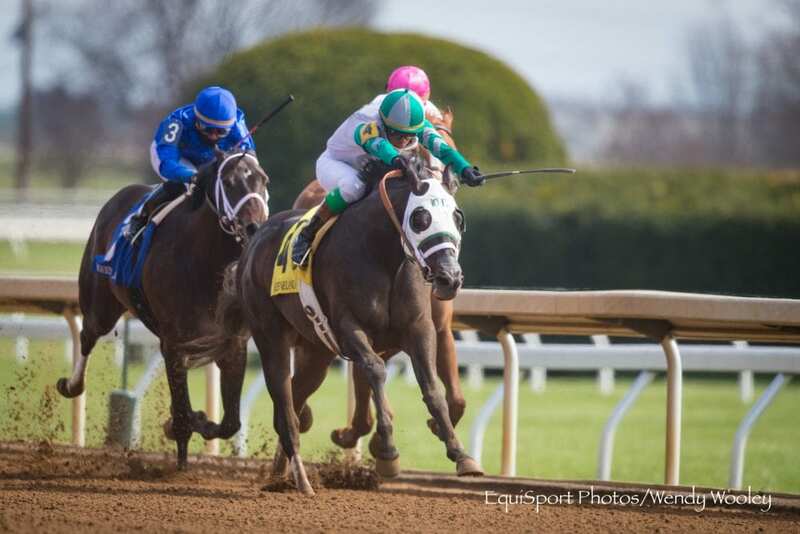 The colt won the April 7 Commonwealth at Keeneland, arguably the biggest victory in his career. The 4-year-old by Warrior's Reward was one of the first horses purchased when the Churchill Downs Racing Club was inaugurated in 2016. The club gives fans a chance to go behind the scenes in Thoroughbred ownership with exclusive club events for morning training, access to the paddock area for the horse's races and complimentary admission to Churchill Downs. More than 40 people have gone on to join other Thoroughbred ownership groups, according to Churchill Downs Racing Club Manager Gary Palmisano. Warrior's Club will break from post 6 under jockey Gabriel Saez in Saturday's Kelly's Landing. Warrior's Club could have his work cut out for him with striking Aristides Stakes winner Chief Cicatriz for owner Roy Evans and trainer Shawn Davis. The gelded-son of Munnings stormed home to a 6 ¼-length triumph in the Aristides under jockey James Graham in a final time of 1:08.44 for six furlongs. Chief Cicatriz (11-8-0-0—$286,881) was previously based in New Mexico with Davis' string of horses but has been in the care of locally-based trainer Mike Johnson since April. Graham has the call on Chief Cicatriz and will break from post position 10. The field for the Kelly's Landing from the rail out: Awesome Saturday (ridden by Brian Hernandez Jr., trained by Bret Calhoun, 121 pounds); Lookin for a Kiss (Jon Court, Mike Tomlinson, 121); Mr. Crow (Joe Rocco Jr., Ben Colebrook, 121); Harmac (Jose Valdivia Jr., Grant Forster, 121); Cool Arrow (Adam Beschizza, Joe Sharp, 121); Warrior's Club (Saez, Lukas, 123); Requite (Julien Leparoux, Ian Wilkes, 121); Storm Advisory (Ricardo Santana Jr., Brian Williamson, 121); C Z Rocket (Shaun Bridgmohan, Al Stall Jr., 121) and Chief Cicatriz (Graham, Davis, 123). The race is named in honor of Summerplace Farm's Kelly's Landing, who earned $1,853,831 from a record of 10-3-2 in 27 starts for trainer Eddie Kenneally between 2004-09. The gelding won the six-furlong Aristides Handicap (GIII) at Churchill Downs in 2005 by stopping the teletimer in a track record 1:07.55 (since eclipsed). His biggest victory came in the 2007 Dubai Golden Shaheen at Nad Al Sheba in the United Arab Emirates. Kelly's Landing also won the 2006 Phoenix (GIII) at Keeneland and 2007 Mr. Prospector Handicap (GIII) at Gulfstream Park. This entry was posted in NL List, Racing and tagged chief cicatriz, churchill, churchill downs, churchill downs racing club, d. wayne lukas, gary palmisano, kelly's landing, warrior's club, warrior's reward by Press Release. Bookmark the permalink.